Maarten Ten Holter at Vripack Yacht & Ship tells me of a further €500,000 price cut on the 104m Blohm & Voss motor yacht he has for sale. This unique vessel was built by the Blohm & Voss Yard in Germany in 1961 and brings to mind the grace and quality of a bygone era. 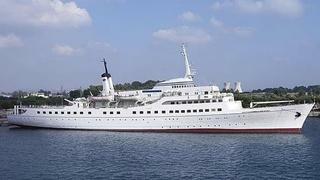 Her appearance and fantastic sheer lines make her eminently suitable for a yacht conversion. She was put into dry dock in 2005 and underwent an extensive survey and a considerable amount of work has already been done on her exterior and interior. Previously asking €3.45 million, this project is now down to €2.95 million.